This quick stir fry is light and flavorful, it can easily be adapted to use any vegetable combination. Serve it over rice or noodles. Heat oil in a wok or large skillet over medium-high heat. Stir fry the pork until cooked through, about 5-6 minutes. Remove from pan and set aside. Stir fry snow peas and bell pepper for 2-3 minutes. Add cabbage to other vegetables, stir fry an additional 1-2 minutes. 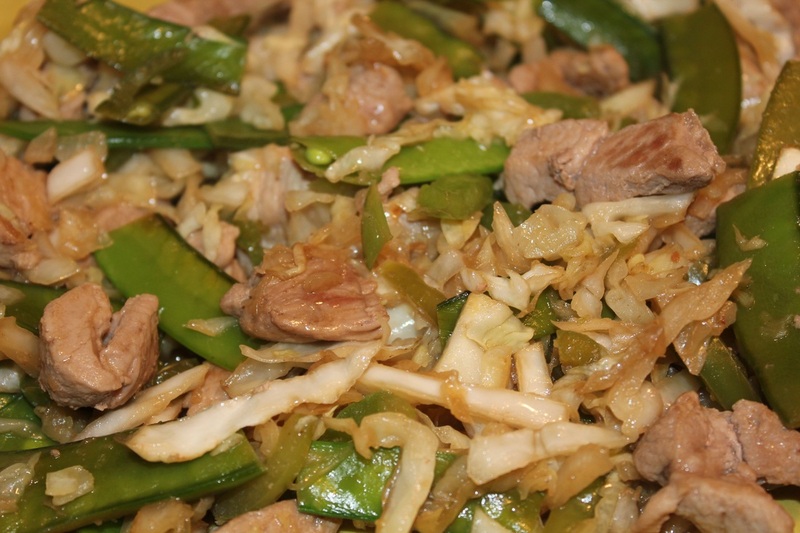 Return pork to pan with vegetables. In small bowl, combine soy sauce, sesame oil, sherry, ginger and cornstarch mixture. Pour sauce into wok, mix well with vegetables and pork. Serve warm.